Commitment to the environment, climate change, sustainability, urban forests and new materials - the main themes of the installations presented in Milan on the occasion of the 2019 Fuorisalone edition. Proposals developed by young designers and big names in international architecture. The 2019 edition of Fuorisalone Milano sees a large presence of installations with narratives that inspire reflection and awareness on the fragility of the world around us, together with projects in which architecture and design propose a wide range of solutions and new materials conceived to champion sustainability. Our journey begins in the Brera Design District, where the Iris Ceramica Group, in collaboration with SOS - School of Sustainability and Mario Cucinella Architects presents a fully immersive installation: MateriAttiva. Thanks to the revolutionary ACTIVE Clean Air & Antibacterial Ceramic™ technology offered by the Iris Ceramica Group, ceramic, which has long been labelled as a “inert coating material”, becomes an active - and indeed an eco-active - material, with a certified anti-pollution and antibacterial action designed to improve the environmental quality of indoor and outdoor spaces where it is used. On April 9 in the heart of the Brera district (in Via Balzan/Via San Marco) a temporary showroom presented by the Iris Ceramica Group will host the première of The Architects Series – A documentary on: BIG – Bjarke Ingels Group, series curated by The Plan magazine for the Italian Group. BIG, the architecture firm founded by architect Bjarke Ingels in Copenaghen in 2005 is currently engaged in various key projects including the Amager Resource Centre, one of the most anticipated buildings of the future, the Danish capital’s WTE (waste to energy) plant which will also serve as a tourist attraction and as place of leisure for locals and visitors. Some of the works that have earned the Danish firm international fame include: the LEGO House cultural centre, museums such as the Tirpitz Museum and the Danish National Maritime Museum, residential complexes such as MTN – The Mountain and public spaces such as Superkilen. The screening of the docufilm will be followed by a lecture titled BIG + Small presented by Kai-Uwe Bergmann, partner of BIG’s architecture firm in New York city. Starting on April 18, the 8th appointment in The Architects Series will return once again at the SpazioFMGperl'Architettura, the Iris Ceramica Group’s exhibition gallery located in the Tortona district. Also in the Brera Design District, in Piazza Cordusio 1 - Via Dante 2, visitors can find architect Michele Perlini’s NO.MADE,a mobile sustainable micro-dwelling, certified as a Mobile Home Casa Clima. A small 3 x 9 metre cell, characterised by a structural frame in COR-TEN steel (weathering steel) and a large glass facade, making it possible to live immersed in the surrounding landscape. At the Università Statale di Milano, on the occasion of the Interni Human Spaces event, the Piuarch architecture firm designed "La Foresta dei Violini" (The Violin Forest), a tribute to the Paneveggio Forest in the Val di Fiemme, home to the precious spruce trees whose wood, known for its special resonance qualities, is used to make Stradivarius violins, many of which were destroyed during the wave of bad weather that hit the Italian Alps on October 29, 2018. 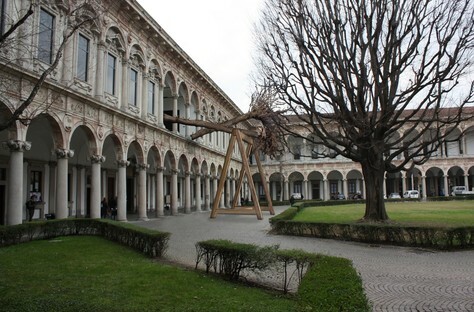 The installation, created with raw wood from the broken and uprooted trees, with their roots in the wind, is witness to nature violated by climate change, a place of memory where architecture becomes an element of sustenance and support, reminiscent of the primordial architecture of the trees and the forest. Sea weeds as a sustainable resource are at the basis of WAVES, installation curated by Francesca Benedetto and produced as part of One Works’ Creative Hub, in Via Sciesa 3. The installation will introduce audiences to “(f)Acts on Climate Change”, a series of initiatives with experts from different fields curated by Daniele Moretti, journalist and expert in environmental issues. The events that will follow in the coming months will focus on the impacts generated by climate change and on the need for a new world paradigm, reminding everyone of the responsibilities and possible actions to be taken on an everyday basis.